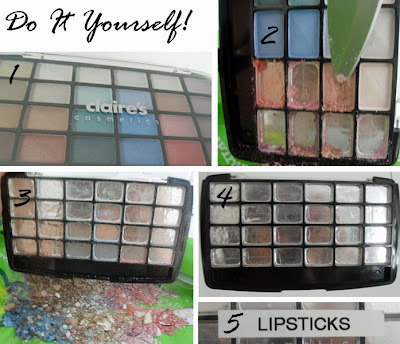 B U B B L E G A R M: DIY Lipstick Paltte! After watching MUpNorth, I decided to go ahead and make my own lipstick palette... I attempted something like this before, but nothing on this scale. This time I wanted all of my 24 lipsticks in one palette. 1) The first thing you need to do is count how many lipsticks you have and either buy or re use a palette that will fit it all. I got an eyeshadow palette from Claire's for £4.99. 2) Scrape off the eyeshadow with a knife. 3) Keep going until it's empty. 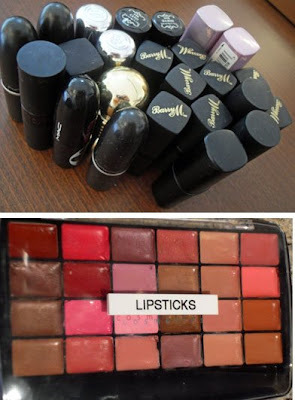 Then, decide in what order you want your lipsticks to be. Cut, melt and pour into individual pans. Be careful with the shimmery ones, I found that they bubbled up and in some cases caused a big mess. Is it worth it? Most definately... You tell me, what you would prefer to take on holiday with you: 24 individual lipsticks or a tincy little palette? Satisfaction indeed :) Click here to see what lipsticks are in the palette! Ah what a brilliant idea!! I was also inspired my michelle! Thats a fabulous idea - I was trying to work out how I was going to be selective about which lipsticks I'm going to take on holiday but now I don't have to be!! what a great idea. I'll have to keep that in mind. Brilliant idea! I should def try this! wow you are brave! this turned out great!! I am way too scared for this! Very inspiring. If I try it, I would probably made some mix to create unique colors. wow!! good idea...!saves so much space! What a great idea! It would be so nice not to limit myself to 1 or 2 lipsticks when I go on vacation! i got a question! since ur melting em and pouring em in, how long does it take them to go from liquid to a solid form? this is pretty cool. I mean why not right? Thanks for sharing this. wow....a girl after my own heart! really great idea hon! we gotta find ways and means!!! thanks for sharing it! wow this is an awesome idea how long did this take u to do?? How much of the actual lipstick did you have to cut off? and what is that color right below the one in the very top right corner? it's gorgeous! WoW!!! I thought you bought it when i first saw the picture!!! You did an Awesome job!! It's definitely great for traveling!!! I know I can't do it, because im a bit clumsy and definitely would mess it up. WOW! I never thought of this! I'm going to buy some empty pans for my MAC quad and melt them into there! Thanks Muhsine! Genius! This is so clever. Thanks for sharing. what a wonderful idea! thanks for sharing gorgeous. Amazin! The result is awesome!!! do you have any youtube tutorials? Brilliant! I'm 100% sure that when I'll have a trip planned ahead I'll actually take the time into doing this. Also, having a palette makes it so much easier to mix colours before applying them in the lips - which is something I usually do. brilliant i must say !! how do u cool them?? All in all it took me about 1 and a half hours. Melting the lipsticks do not in anyway change the formula of them, they are as good as new. It takes roughly 2 minutes for them to solidify. This seems like a hassle to me, couldn't be bothered to do all of this. could you not take 5 lipsticks instead of 20 on holiday? OMG! What a fantastic idea! knowing me I'll end up ruining it though.